If you are like most Americans, you have never heard of a place called Chiba. It’s one of Japan’s forty-seven prefectures (a district similar to a state) in the Kanto region, bordering Tokyo on the eastern coast of Japan. It is a microcosm of traditional Japan easily accessed from Tokyo or the airport. Naritasan Shinshoji, one of the most important Buddhist temples in Japan, is a fifteen minute downhill walk from the train station past little shops in 300 year old buildings along Omotesando (Front) Road. 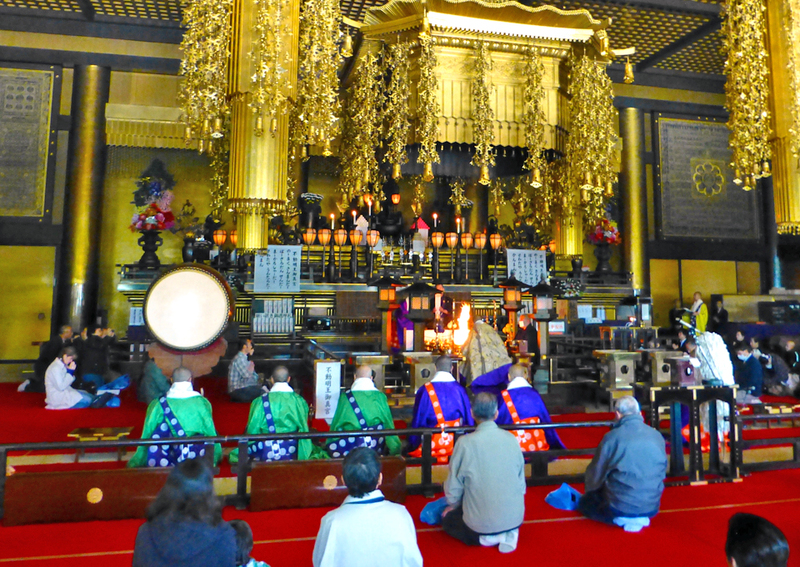 Buddhism came to Japan’s nobility from India in the 6th century by way of China and Korea. The temple, originally built in 940 BC, is a place of Esoteric-Shingon or Tantric Buddhism. For centuries it has attracted followers who pray for prosperity, well-being, and enlightenment. Shakado Hall and the Three Storied Pagoda have been designated national treasures. Followed the cleansing rituals, we inhaled the burning incense and ladled water to wash our hands and mouths. After removing our shoes we were ready to enter the temple for the Goma ceremony. This mystical rite includes mantra chants, the beating of taiko drums, and the burning of Gomasticks by the head monk, a divine offering symbolizing the incineration of worldly passions. Prayers are offered to the enshrined image of Fudomyoo, deity of Immovable Wisdom, a fierce-looking deity with a sword signifying tranquility and release from earthly desires and rope representing the reigning in of enlightenment. It was carved by Koboudaishi, founder of Shingon, under the direction of Emperor Saga. After tracing characters with a special pointed brush, we added our names, home towns, and wishes. We placed our work on the altar facing Fudomyoo and bowed, palms together. Lessons are available every day from 8am to 3pm. As we left we passed the temple of Aizen Myoou, the fierce-looking three-eyed love god bearing a bow and arrow. Outside, ema, little wooden boards inscribed with names of couples seeking blessings for an upcoming marriage, dangled from ribbons. Charms for divine protection from accidents and disasters and amulets for fulfillment of wishes are also offered for a 500¥ ($6.25) donation. Admission is free. Donations are accepted. Volunteer guides are well informed and happy to translate the signs from Japanese to English. Next, we headed for Omotesando Road to see local products–peanuts, sweet potatoes, pickled vegetables, bamboo housewares, and little fish simmered in sugar and soy sauce. Two to three thousand rice crackers are baked daily and flavored with secret-recipe soy sauce at the 3rd generation, 100 year old shop named Hayashida. The crackers are made in several sweet and savory varieties, including those sold on a stick for 100¥ (about $1.25). We bought buns filled with sweet red bean paste at the well-known Pan-cha-ya Bakery and papier mâché dharma dolls with blank eyes for children in the family. Make a wish, color in one eye, keep the doll upright, and when the wish comes true color in the other eye. We removed our shoes, sat by the low table, and were given an oshibori, a small hot wet towel for cleansing hands. The multi-course feast was served in a variety of baskets, covered dishes, and lacquerware boxes. There was magaru (a seasonal sashimi similar to yellow tail), manmori (avocado and salmon soup), tempura, pork cutlet, salad, sautéed chicken with lotus root and chili, pickled radish and ginger, thick white udon noodles, soba (buckwheat) noodles, and the house specialty, Unagi Donburi, a seasonal and pricey eel from the Tone River, served with their time-honored specialty sauce. Oishi (delicious)! This set meal costs 4500 ¥(about $55). The eel dish alone is 1600¥, (about $20). Kikuya’s food was delivered to Steven Spielberg and Tom Cruise’s private jet when they were filming in the area. Then it was immersion in Japanese-style fun and relaxation at our hotel, Ryogujo Spa Hotel Mikazuki on Tokyo Bay in Kisarazu City, the top hot spring in Chiba (from 27,400¥, about $325). Day visits to the spa are possible, but for the full experience, plan to stay overnight and soak in the atmosphere. At check-in we opted for full-length yukata, a lightweight cotton kimono, pink for the ladies and blue for men, to wear during our stay. The alternatives, a two-piece, knee-length pajama-style for men and mu-mu style dresses for women, both in splashy prints, seemed to be the more popular choice. The guest room had both a western-style bed and tatami mat area for sleeping on the floor. There was a low table with a thermos of hot water, tea leaves and cups. Slippers and socks were provided for use inside the hotel, but had to be removed when crossing from the hotel to the building for dining and the spa. Slipper etiquette also requires a switch to the special toilet slippers provided in the restroom. Leave it to a country that leads the world in electronics to have high-tech toilets with heated seats, sound effects for privacy, and aquatic options based on gender, often with colorful descriptions. Some have lids that open upon approach and close on departure. Swimsuits are worn in the hotel pools but not for communal bathing in the gender-separated hot springs or individual gold or silver tubs. Guests are given a bath towel to be kept in the locker and a hand towel to cover essential areas then fold and place atop the head while bathing. This spa hotel is an ideal family getaway, with an assortment of playrooms and amusements, video and game machines for kids, games of chance, a unique collection of statuary, and karaoke booths. The locker key–blue for men and red for women–can also be used to charge items in the stores, restaurants, esthetic and massage salons, and souvenir shops. Meals include a fascinating assortment in the all-you-can-eat buffet dining room that overlooks the bay. There are Chinese and Japanese restaurants and plated, multiple course dinners served with flaming style in the banquet hall or private dining rooms. About 70% of Japan is covered by forested mountains, and the next day we took a cable car up one of them, Mt. Nokogi, in Chiba’s city of Kyonan. Monks have trained here for over a thousand years and it was a stone quarry in the Edo period. Mt. Nokogiri is the site of Nihonji, a Buddhist temple founded in 725 under orders from Emperor Shomu. Hundred-shaku Kannon, the Goddess of Mercy, is carved into the face of the mountain. A shaku is 30.3 cm., or 11.93 inches, making the goddess 30.3 meters or nearly 100’ tall. Those with difficulty hiking on steep uneven terrain may want to avoid the hiking trail approach and take the roadway. 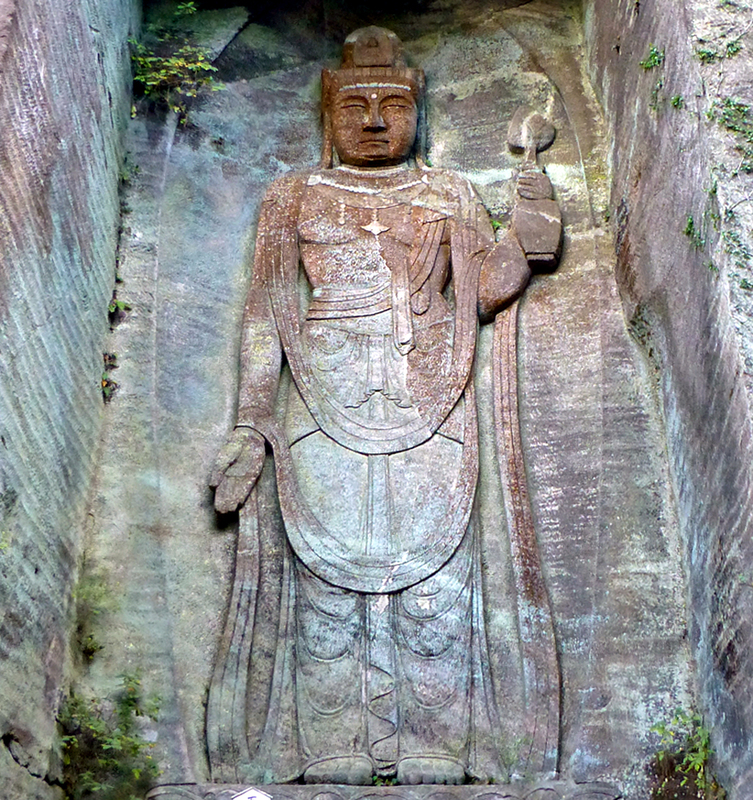 The mountain’s Nihonji Daibatsu (Great Buddha) holds a bowl with his left hand and his right hand palm upward, a common pose of a Medicine Buddha. 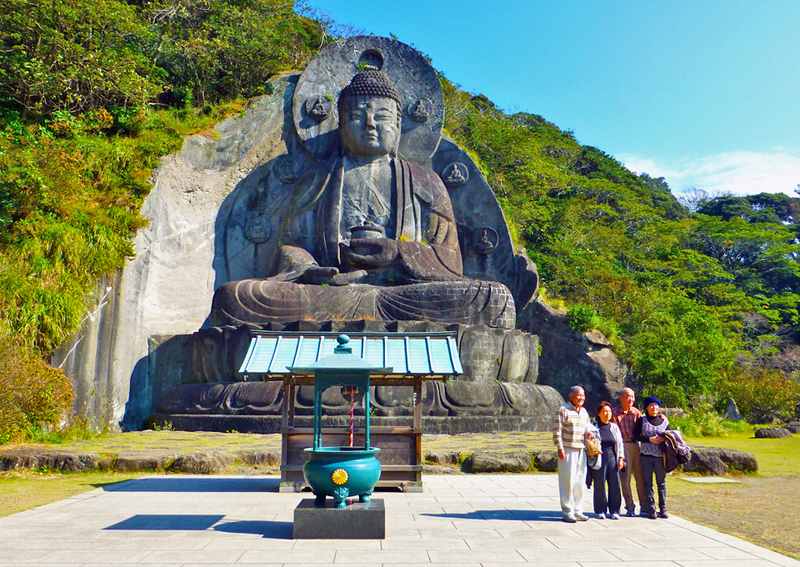 At 31.05 meters (101.9’) it is one of the largest stone images of Buddha in Japan. It was completed in 1783 and restored in 1969. The mountain’s 1500 Rakan (disciples of Buddha) were created during the same period. Charms and amulets were available. We were off for a scenic train ride and disembarked in Yorokeikoku, site of a farmers market and foot bath that is free with a train ticket. Then we visited a potter in the mountainous countryside who had to guard his wares from monkeys in search of a smashing good time. Where else can you have this much fun in just two days? Japan Airlines now offers direct flights between Boston and Tokyo’s Narita International Airport, which is in Chiba.